TOKYO (AP) — Asian markets were moderately higher Thursday, tracking solid overnight gains on Wall Street despite lingering concerns about the U.S. withdrawal from the Iran nuclear deal and trade tensions between Asia and the U.S.
KEEPING SCORE: Japan's benchmark Nikkei 225 rose 0.3 percent to 22,486.01. Australia's S&P/ASX 200 gained nearly 0.3 percent to 6,123.50 while South Korea's Kospi added 0.3 percent to 2,451.48. 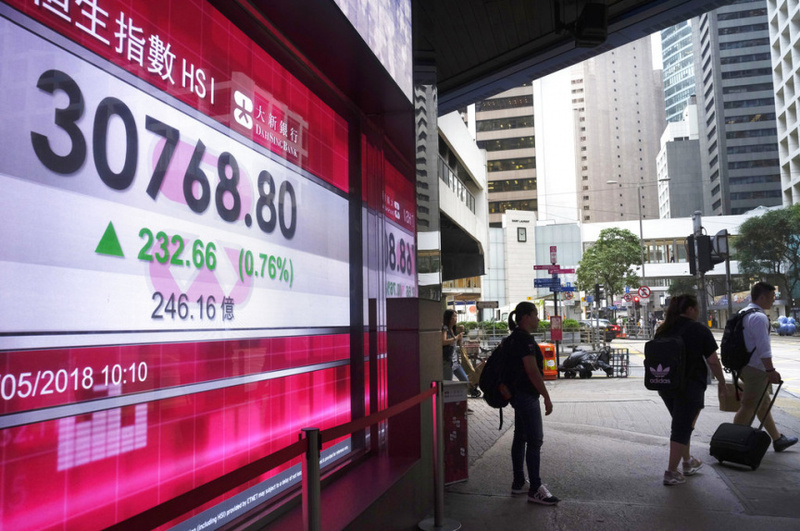 Hong Kong's Hang Seng was up 0.9 percent to 30,805.88 and the Shanghai Composite gained 0.2 percent to 3,165.11. Shares were higher in most other markets apart from Singapore. WALL STREET: The S&P 500 index rose 1 percent to 2,697.79, nudging into positive territory for the year. The Dow Jones industrial average posted its fifth gain in a row, 0.8 percent, to 24,542.54. The Nasdaq added 1 percent to 7,339.91 and the Russell 2000 index of smaller-company stocks picked up 0.6 percent to 1,596.05. ENERGY: Benchmark U.S. crude oil added 59 cents to $71.73 a barrel in electronic trading on the New York Mercantile Exchange. It climbed $2.08, or 3 percent, to $71.14 per barrel on Wednesday. That's the highest level in nearly three and a half years. Brent crude, used to price international oils, gained 58 cents to $77.79 per barrel. CURRENCIES: The dollar strengthened to 109.69 yen from 109.65 on Wednesday. The euro fell to $1.1872 from $1.1877.